The Gradishteto hill site near Riben has been known for long in the scientific literature. Until most recent time, it has been often wrongly identified with the Roman road station Ad putea. The excavations in 2013-2015 brought about much new evidence about the site but it was, unfortunately, partly misinterpreted by the investigators. The archaeological campaign in 2016 considerably enlarged the database and made it possible to thoroughly reconsider the traditional views and statements. It was proved that the habitation of the site began already in the Early Chalcolithic. In the Late Iron Age, if not even earlier, regular cult practices started to be performed here and a rock-cut sanctuary came into being. In the Roman period it developed into an important cult complex that ceased functioning in the late-3rd c. A burgus was built over its ruins in Diocletianic times, which was integrated in the mid-4th c. in the defensive system of a newly established fortified settlement. The latter suffered a destruction in the late-70s of the 4th c. but was soon rebuilt and resettled by new population, maybe of Gothic origin. 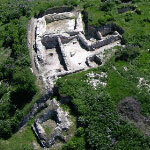 By the mid-5th c. the settlement was again destroyed. The life resumed in the 10th c. and went on until the end of the 12th c. at the earliest. In the late-14th c. a coin hoard was buried in its ruins. Torbatov, S. (2018) “Градището край Рибен”, Bulgarian e-Journal of Archaeology / Българско е-Списание за Археология, 8(1), pp. 17-65. Available at: http://www.be-ja.org/index.php/Be-JA/article/view/165 (Accessed: 23April2019). The authors retain full copyright on the articles or other publications. All materials are published under the Creative Commons Attribution-Non Commercial-No Derivatives 4.0 International License, under which materials may be distributed or reproduced freely, provided the original is unchanged and is quoted correctly.